Pruning shears are an absolute necessity for any successful gardener, whether you are new to the gardening game or you have been at it for years and years. The ones available for purchase on the market today feature some pretty amazing new technology, so that pruning your plants and trees no longer needs to be the intense chore it was in the past. Read on to learn more about these remarkable tools and which ones we most recommend for purchase. 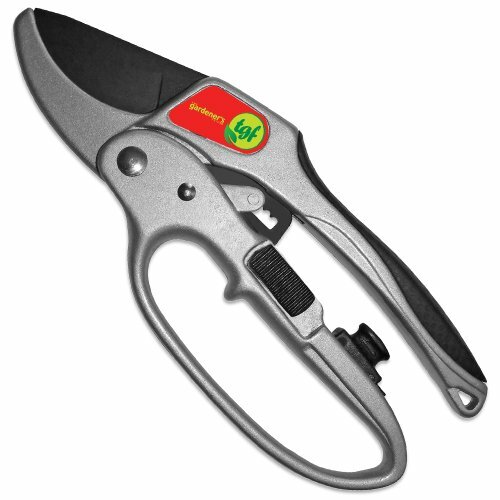 Pruning shears are helpful tools for working out in your garden. They are a handheld device that you can use to quickly and easily chop through everything from flower stems to thick tree branches with minimal effort. These are a must have for any serious gardener. Pruning shears can use a variety of different types of cutting mechanisms to get the job done. There are models that are spring operated, and those that use a ratchet mechanism, which is typically less effort and may be better for those with weaker hands or hands that are compromised by age or arthritis. They are entirely manually operated, so they can get tiresome after a while. The best ones mitigate this fact by having ergonomically designed handles that will still feel comfortable even after hours of making cuts. There are even some with handles that are easier to manipulate for those users who may experience arthritis or other sources of hand pain. Some have locking mechanisms that enable them to lock at a wider or closer range of openness. This quality can be helpful when cutting plants that may have a wide range of thickness in branches, such as fruit trees. You will be able to make more precise cuts at closer range, yet still hack through thick branches at wider range. The Garden Elite really do live up to their name: these are truly the elite when it comes to these options. They can easily chop through branches of up to one full inch in thickness with minimal push back. But do not think that just because they are powerful that they are also difficult to use – far from it! These come with comfortable handles and are easy to operate, even for people with hands on the smaller side. The shears also arrive with an extra blade and an extra spring, so you have replacement parts conveniently on hand if necessary. It would be difficult to find a pair that are more effective for all gardeners than these. The Garden Elite Shears are really the top of the line option. They strike the exact right balance between being super effective and super easy to use – which is to say that they are both! The only issue is that they can be difficult to lock and unlock, which actually speaks more to their safety system than to any sort of design flaw. The gonicc Professional Sharp Bypass Pruning Shears are the best option you will be able to find when it comes to cutting roses. They are incredibly sharp and are also small enough to be manipulated into tighter areas so you can make super precise cuts, which is a necessity when pruning thorny roses. These are also great when it comes to versatility, as they are great for cutting thin, younger flower stems all the way up to thick tree branches. They can cut through stems of up to half an inch in diameter, so do not think these are lightweights just because they are great at cutting roses. These blades are made of high quality steel and the whole model comes with a sturdy safety catch, so you will not have to worry about accidentally nicking yourself in the process. 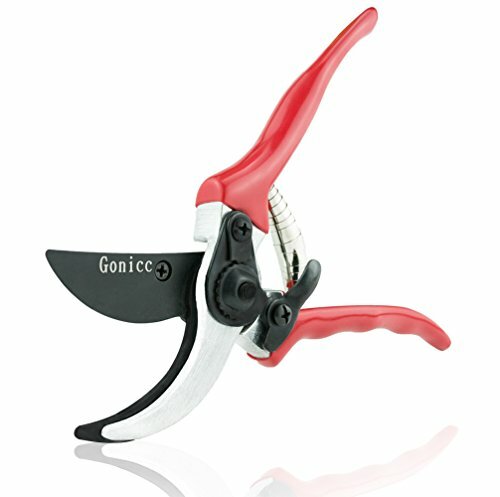 If you have roses in your garden, the gonicc Professional Sharp Bypass Pruning Shears are an absolute must! The gonicc Professional Sharp Bypass Pruning Shears are excellent when it comes to pruning roses, with versatility enough to be great at other uses as well. The only thing to take into consideration is that these are not meant to be used by those with smaller hands. 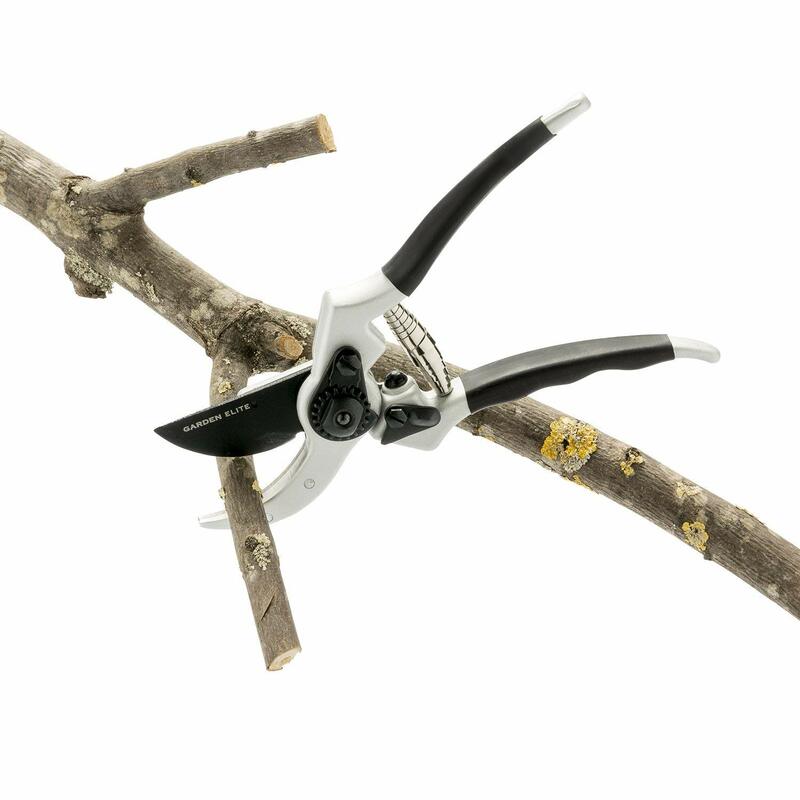 The Haus and Garden EnduroPRO are the ideal pruning shears for working with fruit trees, which tend to have branches of a wide variety of different thicknesses. 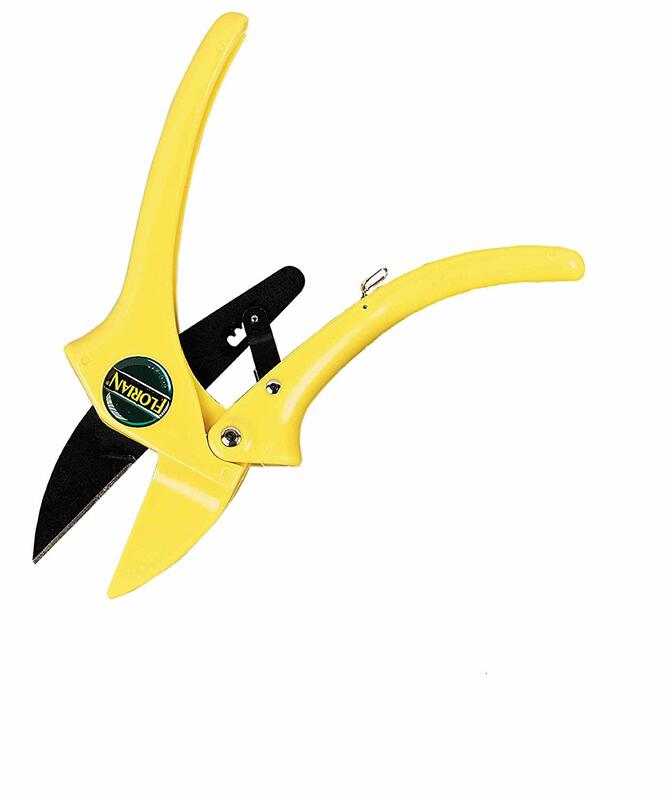 These shears take that quality head on with their two step locking mechanism that allows for both fully opened and halfway opened spring actions to cut branches of different thicknesses with ease. This locking mechanism is also incredibly secure, yet is still simple enough to be operated with just one hand. The included guard around the spring is excellent at keeping out cutting debris, which can be a real issue for anyone who is cutting fruit trees. These shears are made of high quality material that will last an incredibly long time. They can be manipulated to trim in very tight spots, which will definitely come in handy when pruning fruit trees. All in all, you will not be able to find pruning shears that work better for fruit trees than the Haus and Garden EnduroPROs. The Haus and Garden EnduroPRO are ideal shears for pruning fruit trees for a variety of reasons, most noticeably their versatility. However, keep in mind that the included instructions for use are not very well written and will not be a great help. 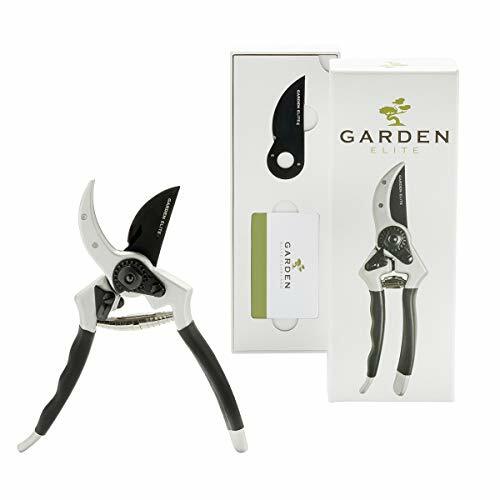 The Gardener’s Friend Pruners are the perfect pair for people who are getting on in years and whose hands may be cramping up with age. They are smooth to use and not particularly demanding on your hand tendons. They come with a soft rubber hand grip that is accessible for anyone to use, even those with mobility issues. And they pack just as powerful a punch as regular models – they can cut through branches as thick as a nickel is wide, even while being used with just one hand. Plus, they do not produce any sort of blade flex, the ultimate source of frustration for gardeners, even when they are cutting large branches at awkward angles. If you have any sort of arthritis, you will not be able to find a pair that are easier to use and more effective than The Gardener’s Friend Pruners. The Gardener’s Friend Pruners are excellent for those users whose hand mobility may be beginning to be compromised by age and/or arthritis. They do arrive very stiff right out of the box, so it will likely take some time before they are properly broken in, but once they are, these can be enjoyed for all of the golden years. With all of the outsourcing to factories and manufacturers overseas in today’s American economy, it is becoming more and more difficult to support local American businesses without breaking the bank. These hit the sweet spot in that regard. They are made right here in the United States of America (in California, to be exact). And they compromise nothing when it comes to quality, even when compared to others made overseas. Their ratchet action mechanism makes it easy to use these to cut through even the thickest of branches. The distinctive bright yellow color on these also make them super easy to find in the midst of your garden or yard, so you will never have to worry about losing yours and needing to get a replacement pair ever again. Overall, the Florian Ratchet Pruners are a great choice! The Florian Ratchet Pruners are excellent pruning shears that you can feel good about buying because you are supporting homegrown, American labor! The only thing to take into consideration with these is that the handles are made of plastic, but there is certainly no impact on quality as a result. How Do You Care for Pruning Shears? The best can last users years and years, but they need to be properly maintained. The best process to take care of pruning shears is as follows: remove rust by soaking them in vinegar for a day and a half. If rust remains after a prolonged vinegar soak, the next step is to use nail polish remover. Dab a little bit of nail polish remover onto a clean cloth and rub the rust right off. After that, you pour a little bit of lubricating oil on your cloth and work it into the moving parts, so right around the hinge area. Use a dry part of your cloth to wipe off excess oil. Check out the video below for a full overview of what was just described! 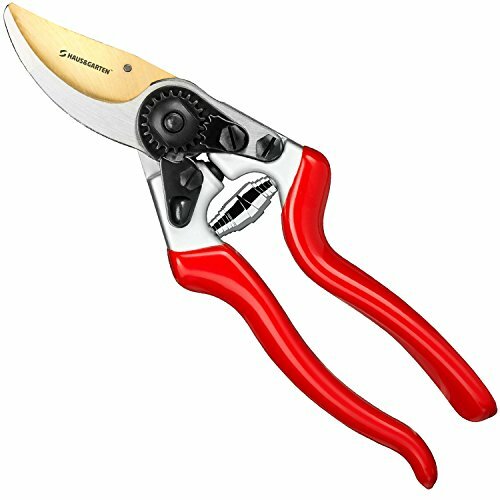 Pruning shears are a go to tool for any successful gardener, whether you have a giant plot of land full of fruit trees or you are simply maintaining some rose bushes on your apartment balcony. If you keep in mind the qualities you are looking for, such as versatility and handle comfort, you will certainly be able to find some that will work great for you from the list outlined above. Also, make sure to take good care of them, as these are tools that could hypothetically last you years and years if they are properly maintained.